We had a great visit with friends to St Louis this weekend. The zoo was fantastic… the Botanical Gardens amazing: we especially enjoyed a temporary exhibit up at the moment on “Extreeme Tree-houses” — at least a dozen “tree houses” made by artists, these not up in trees but around the bases. All enchanting/engaging in different ways. But here I want to discuss the great, amazing and very strange City Museum. We forgot a camera so I am going to rely on the museum’s promo photos. 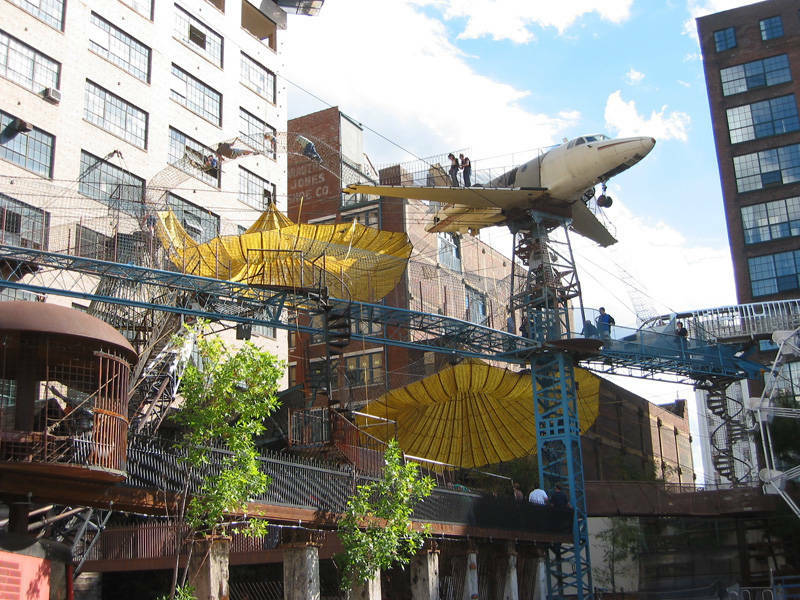 City Museum is a museum, consisting largely of repurposed architectural and industrial objects, housed in the former International Shoe building. …The museum bills itself as an “eclectic mixture of children’s playground, funhouse, surrealistic pavilion, and architectural marvel.” Visitors are encouraged to feel, touch, climb on, and play in the various exhibits…City Museum was founded by artist Bob Cassilly, who remains the museum’s artistic director, and his then-wife Gail Cassilly. The museum’s building was once a shoe factory and warehouse but was mostly vacant when the Cassillys bought it in 1993. Construction began in January 1995 and the building opened to the public on October 25, 1997. 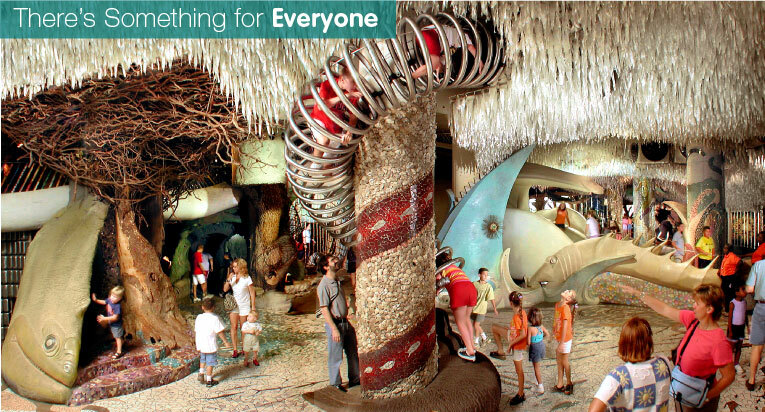 The museum has since expanded, adding new exhibits such as MonstroCity in 2002, Enchanted Caves and Shoe Shaft in 2003, and World Aquarium in 2004. A circus ring on the third floor offers daily live acts. The City Museum also houses The Shoelace Factory, whose antique braiding machines makes colorful shoelaces for sale. A minute or so into our visit, Celie and Iris and their buddy Thea climbed up into the curling metal slinky-like tunnel you can see in the center of this photo. They disappeared from view. Where did they go? We had no idea. There is no way to find out. They popped out somewhere. At one point we heard their voices in the din. For a while we thought we would have to climb in too to find them, but were worried we were too fat. Eventually we went up some nearby ramp and eventually spotted them across several shafts and small bodies of water, stone dinosaur heads, and numerous other chutes and passages leading into the ceiling, walls, or floor. Some tight passages and tunnels end abruptly such that you have to back your way back out. At one point I found myself walking through an enormous 19th-century bank vault door that felt as if it might clang behind me. There are a lot of opportunities to walk into the mouth of some creature or another. Some very digestive shapes in the tubes and cylinders. You kind of feel you might get dumped down into the garbage compactor of the Death Star. The whole museum is kind of like this. In one spot there’s a small closet-like door or rather hole in the wall. If you go in there you enter a somewhat creepy little labyrinth with several layers of wall space, lit by a few dim Christmas bulbs. You feel a bit like a mouse in the wall. At other points you can look up and see people walking above, or look down and see some kid waving under your feet. Somewhere in the central enclosed system of spaces on the first floor we encountered a heavily tattooed dude who was one of the first museum employees we’d encountered. He pointed out to us a spiral staircase we could climb up that would eventually allow us to chute down a 10-story slide to the bottom. When I asked him if it was scary for kids he said, “well, I put my 17 month-old in it, and he survived!” We decided to give that one a miss. Celie I did go down a shorter slide that created a beautiful kaleidoscopic effect as painted metal tubes spin from your hands. It’s kind of like a Dangerous Museum for Girls and Boys. I seriously am bewildered about the liability question. I have to assume that they know what they’re doing, but kids must get hurt now and then (or at least scared and stuck). Thea skinned her knee and there was a whole first-aid center at the front administering band-aids cheerfully. But the kids were in ecstasy. They were really exploring and it was not all administered and explained to death by adults. There’s potential for some actually scary moments, but the overall feeling is joyfully creative and surprise-filled. You can see all the seams of the museum, it’s kind of a giant Rube Goldberg device. Outside we entered a teetering, winding metal structure hanging off the side of the building that led at one point to a de-purposed fighter jet. Unnervingly, the inside was not really stripped clean but was bristling with cut off wires. Iris sat in the cockpit and steered a bit. Down below were some people selling beers and margaritas (!). Sarah is convinced that anyone could apply to set up shop and sell something. On weekend nights it is open until 1:00 a.m. and occasionally they have “sleepover nights” when you can camp out on the roof — which we did not even make it to; it apparently contains a Ferris wheel, and there is an aquarium somewhere. There seemed to be a wedding going on, as various well-dressed older people started streaming in towards closing time. ?!!! What a cool place, a wildly imaginative version of urban renewal via the arts. One other tidbit from our trip — we happened basically by accident on this amazing restaurant, the Firefly Cafe, in Effingham Illinois. Where the Eff is Effingham? On 70 between Terre Haute and St Louis. It’s in a giant former barn with a big organic garden attached and a lake in back filled with huge koi. Saveur magazine or somewhere named it the #2 Most Sustainable restaurant in the U.S. a couple years ago. We had a pretty light lunch but the food was fantastic– amazing beets and greens salads from the garden. Want to figure out some way to arrange for dinner there. Well seriously, I’d better plan my cross country trip soon, to get Isaiah there before he grows too much bigger … I’ve been keeping my eyes open for good stops to determine our route! This made me think of Hogwarts. The bandaid station reminded me of Sophia’s 8th birthday party, when her whole class slid and played gleefully on the heavily ice-crusted lawn, and afterwards I circled the table while they ate cake, handing out bandaids for their ankles and legs — so many cuts from falling through the ice. Even I want to go to this, get lost, scare myself, end up with cuts and bruises and band-aids. Ferris Wheel — must go! sure people can get hurt only if theyre not safe. I went to the city muesum last month with my aunt and uncle and my 8 year old sister and im 11 and we had a blast!!! It is perfectly safe as long as you dont do something stupid!!! if you feel like youre going to get hurt on something bthen dont do it!!! it is a great place for kids to have fun and be KIDS. Don’t listen to the negative comments on here it is a wonderful place. You can go up in the arch, go to a basbell game, and go to the city muesum. Something fo the whole family and all of it is downtown St. Louis!!! HAVE FUN!!! !